Here are some links to various Foucault testers, some of which also include how to use the tester and other nice things about the testers. I suggest that you go through all the sites and understand how they all work before you make your own and evaluate each of the advantages of one particular feature of each of the different designs. Please let me know if any of these links fail to work for a while. Please note that some websites go down due to Acts of God and then go back up days or even weeks later. One of the things that you have to remember when using a Foucault tester is to make sure that the mirror and tester are in firm ground. You are setting the tester to positions of less than .0001" in most cases for the amount of light you are letting by the Knife Edge so things like card tables and even dinner tables are not rigid enough to support the tester and mirror. If you are unsure as to where to do the test, there's always the garage floor as a nice concrete floor which is very stable. You should also be insuring that the air in the area of the testing is stable so that the light won't be affected by the changes in refraction from differences in the temp of the air. Note that a hand near the mirror makes the air boil so badly that it's impossible to read the zones of the mirror. If you can't get the air still, consider the opposite effect where a fan is used to homogenize the air in the room. I might note that sometimes the links are changed and going to the senior page will often get the page you want. You might also want to look at the senior pages just to see more of what the page's owner has done in his pages. These sites were all found by the Google Search Engine looking for "Foucault Tester". 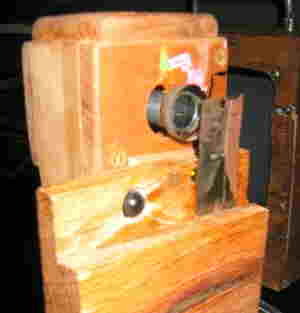 Knife edge with a security camera (inside the wood box) with the lens sticking out. Also notice the "finder" LED to the left of the razor blade. 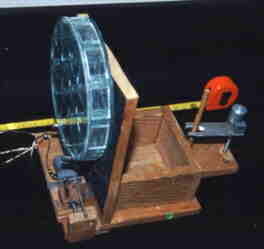 The measuring part of the tester. Testing various mirrors. 12.5" at the left with a large hill in the middle. A 12.5" at the right. Since I'm testing so many mirrors, there is a tape measure behind the tester and stand to set the test stand in about the right position. Note how useful the viedo setup is for testing? The lifting mechanism at the back of the mirror stand. Me testing a mirror. Note the little white box near me which controls the mirror stand and the monitor to my left where I view the image of the Foucault test..
A nice photo of the test stand with a Richard Schwartz fused mirror on the stand. You can also see the tape measure behind the stand and the two motors that are used to point the stand without anybody having to stand back at the stand. The bin behind is used to hold the various parts associated with the stand when stored. Also note how warped the stand is! It still works fine and holds mirrors well. Another photo of the Foucault Tester head, this time with the finder LED on. The target for it is the black square on the right side of the camera head, just above the razor blade. This little feature assists in finding the return of the mirror's reflection when setting up a test. It usually takes me about 30 seconds to align a mirror including finding the approximate focus. 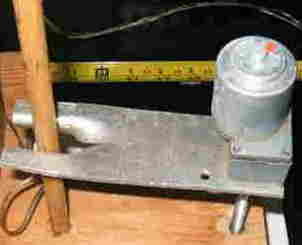 Bob Davy's slitless tester A basic Richard Berry tester and a bonus of a .PDF file for a Ronchi Grating. Robert Duvall's Tester Nice description of how a tester works and construction of a Richard Berry tester along with info on Ronchi testing. 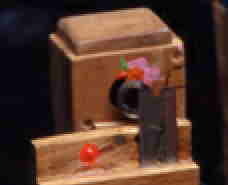 Dave Kelly's fancier tester Made from aluminum stock and has a camera for viewing the test. Chris Kovacs tester with a small telescope attached Also has some not quite accurate shadowgrams (only shows half of the image) of the Foucault test. An interesting one from Africa It is a nicely done metal one with micrometer motions. Berthold Hamburger's design This page also includes some theory about testing. 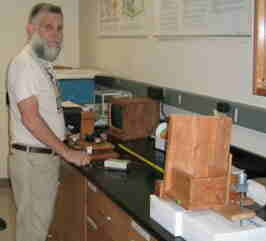 Glen Bankston's tester and it's uses page Just the basic tester with a good drawings on building it. 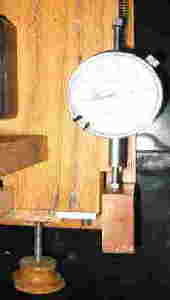 A fixed slit tester based on the Texerau book What more can I say. Bill Arnett's cheap tester (according to him) Also has a lot of nice, but dark, photos of his mirror in the various stages of polishing. A nice study in what happens during figuring. Thanks Bill! Yrj Pullinen's Tester. Mostly pictures of a complex tester but look anyway. Here's a bunch more links which are not itemized. All kinds of stuff concerning testers are here. I might note again that sometimes pages disappear and it's always nice to quickly give a note to the me if any of these links fail from the page going away. Please note that most servers do go down on occasion for anything from maintenance on the server to acts of God. Here's my email link so you don't have to go looking for it. 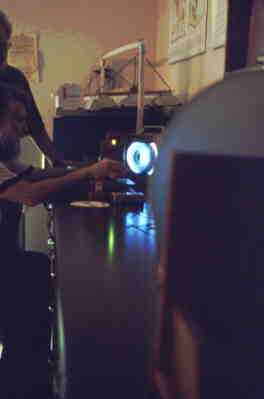 Several of the testers use a television camera to allow the tester to see the optics under test without having to get into a delicate position. This is very easy to do! Just get a lens (or set the zoom lens) so that the mirror is pretty much filling the entire screen. Needless to say, you focus the lens on the mirror. You then just use the camera as your eyeball with the lens as close to the knife edge as you can get it and you will see the same thing as what you see if you put your eye behind the knife edge. Having the camera riding on the platform so that it moves with the knifeedge is the best way of doing it as you don't have to adjust the camera's position all of the time. You can also use the camera in place of your eye with the Ronchi test. The procedure is also useful for taking pictures with a 35mm camera. 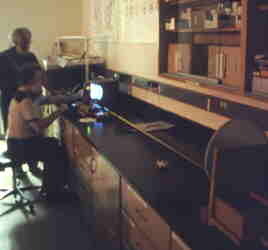 The testing is best done in a darkened room as that will allow for better contrast as a mirror not returning any light will indeed be dark. Here's the home base for the TEX software for PC's This is a very nice piece of software although it runs in DOS. Many of the pages listed above contain other information including images or drawings of the image seen at the knife edge of the tester. Good Luck.